Here is the video of my session from MAX 2009 – Introduction to BlazeDS and LCDS. In this session I walk through the basics of connecting Flex applications to BlazeDS and LCDS. Let me know what you think! The combination of RIA and Cloud is the future of software because it provides full client capabilities and easy deployment. The chart below illustrates this in comparison to the other major software architectures (main-frame, client / server, and web). In line with these trends Adobe and Salesforce.com announced today that they are working together to unite Rich Internet Applications and The Cloud. At the core of this announcement is a developer preview of the Adobe Flash Builder for Force.com tool. This tool enables developers to easily build intuitive user interfaces with Flex which connect to the Force.com cloud platform and Salesforce.com CRM data. These applications can be deployed either in the browser or on the desktop using Adobe AIR. When utilizing Adobe AIR, the applications can still function when users are disconnected. Later, when users reconnect, the changes are synchronized with Force.com using the LiveCycle Data Services synchronization engine. 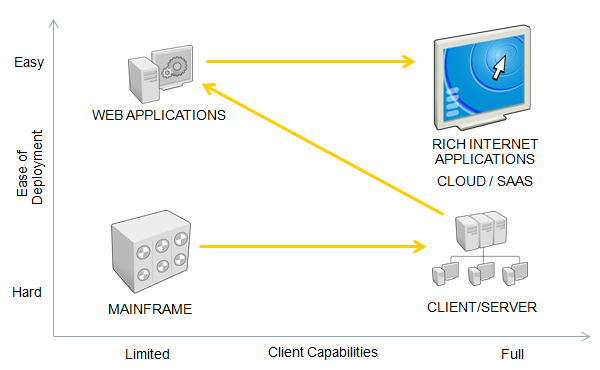 It’s really exciting to see how the vision of Rich Cloud Applications is becoming reality! Another great way to learn more is to sign up for a Webinar / Tech Talk that I will be co-presenting. Let me know what you think about this exciting new partnership and developer tooling. Also Drunk on Software will be there filming some episodes. So this is certainly a MAX you don’t want to miss! I hope to see you there! You no longer need to use the ProtectedMessagingAdapter from the code examples below in order to protect your messages. One of the great things about Flex is how easy it is to set up publish and subscribe messaging using BlazeDS, LCDS, or other various server technologies. Basically a Flex application can be either a Consumer of messages from the server, a Producer of messages to the server, or both. The channels that are used for the actual transport can vary dramatically depending on the needs. Here is a great blog that explains the different transports. No matter what transport / channel is used the API in Flex is the same. If you’d like to see how to use those APIs check out this video I recorded. Many times with pub/sub messaging the messages should only be sent to a subset of the subscribers. There are two ways to achieve this in Flex – either using a subtopic or a selector. Subtopics allow simple dot separated expressions such as “stocks.ADBE” which would allow Flex clients to subscribe to only messages about the ADBE stock. A Flex client could also subscribe to wild card subtopics like “stocks. *” or “*”. The developer usually hard codes the subtopics (if any) that an app will use. If you are using subtopics (or selectors) to protect messages from being sent to the wrong people then I highly recommend that you use my ProtectedMessagingAdapter or something else so that malicious hackers can’t snoop on private messages or send impostor messages. In my demo I run both the test app and hacker app on the same server but this can be done in other ways (such as proxy servers or local apps). Also authentication may not protect you because a malicious user might also be an authenticated user. So the only solution is to really protect destinations from subscriptions to wild card subtopics. I hope this is helpful for those using messaging. Let me know what you think. A little over a year ago Adobe opened the AMF spec. Now Adobe has announced it will be opening the RTMP spec! Wahoo!!! This is big news for Flex developers! For those that don’t know, RTMP is the streaming protocol used for streaming video and audio in Flash Media Server and for streaming data in LiveCycle Data Services. The spec is expected to be published first half of this year. Over the past few months Greg Wilson, Christophe Coenraets, and myself have been hard at work on a secret project. So today we are proud to announce the new Tour de Flex has just gone live! Tour de Flex showcases the capabilities of Flex, BlazeDS, LCDS, Adobe AIR, and Flash Player (now collectively called the Adobe Flash Platform). Like the old Flex Component Explorer, Tour de Flex can be used to find components. But it goes way beyond just out-of-the-box Flex components. This first release contains 217 components and samples including popular Cloud APIs like Salesforce.com and Intuit, numerous community components from people like Doug McCune and Tink, commercial components from companies like ILog, and numerous other goodies. If you find something missing you can submit it! Also in this release is an Eclipse / Flex Builder plugin which allows you to find components from inside Flex Builder! We hope the Tour de Flex will provide an easy way for you to find components and see what is great about the Adobe Flash Platform. Give it a try and let us know what you think! A podcast I recently did with Chariot Solutions has just been published. Let me know what you think. Here is the recording of a presentation I gave at the NLJUG a few weeks ago on Flex and Java. I hope you find this useful. Let me know what you think.